DeepDark Designs proudly presents Legendary Adventures. This series is intended to provide an accessible and versatile resource for game masters on a budget and with limited preparation time, or those simply looking for inspiration and new ideas. Each Legendary Adventure is compatible with the fifth edition of the world's most popular roleplaying game–also sometimes known as OGL 5e ruleset–and offers game masters captivating adventuring materials, plenty of new rules options, and much more besides. This is the 5th Legendary Adventure released to date, and is called Harrowing Heights. Weighing in at 112-pages, Legendary Adventures: Harrowing Heights offers game masters a thrilling 46-page adventure, 25 pages of introductory materials, and 40 jam-packed pages of appendices bursting with new and original ideas. The adventure is suitable for 3-5 players of 1st to 5th-level and should easily last a group 6-12 sessions, depending on the duration of each. In addition to this, the introductory materials provide key information on the adventure's background, as well as adding geographical context, lore, and other flourishes which both helps set the scene for the action that follows and grounds the players in the narrative. Meanwhile, the appendices add 26 new varieties of kobolds and drakes, 17 bespoke, adventure-specific NPCs, and 24 fun, original magic items. Best of all, Harrowing Heights has been lovingly illustrated with full-colour artwork and mapping throughout. Legendary Adventures: Harrowing Heights is available in both digital and physical print editions. The module's digital files are also provided in a multitude of formats for your convenience and ease of use, including several that are reformatted so that you can quickly and cheaply reproduce them at home or take the files along to your local print shop and have it done there. 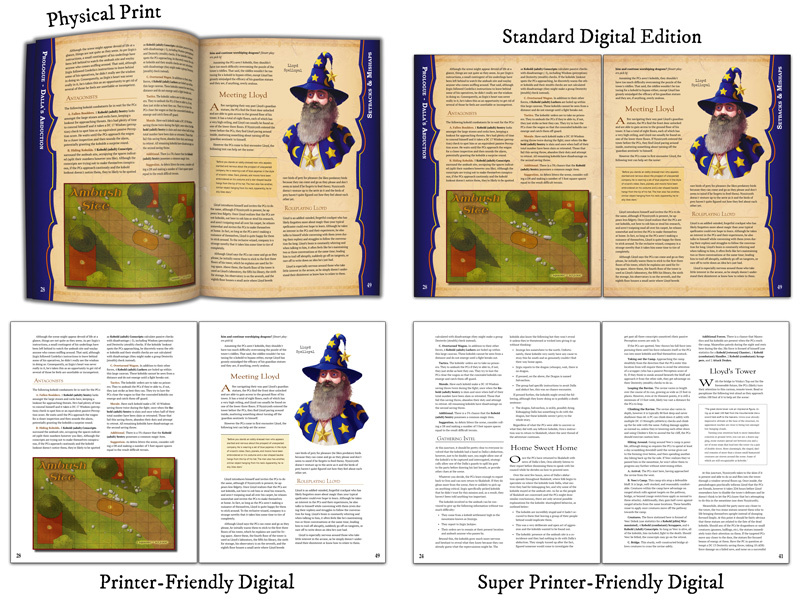 Examples of the physical edition as well as the standard, printer-friendly, and super printer-friendly versions of Legendary Adventures: Harrowing Heights can be found just below. Scroll down to find a faster-loading, higher-quality preview of Legendary Adventures: Harrowing Heights. A level 1-5 adventure module for 3-5 players and a game master that pitches the PCs against kobolds and drakes, with strong nordic-themes and a focus on overland travel. 40-pages of appendices containing 26 new monsters, 17 NPCs, and 24 magic items. Adventure-specific hooks to help players ground their characters in the adventure. Regional information on the Holgathi Highlands, including descriptions of more than 20 additional settlements and Points-of-Interest. More than a dozen high-quality, full-colour illustrations, and 6 stunning maps. An expanded digital suite, including 'Standard', 'Printer-Friendly', and 'Super Printer-Friendly' editions of the product. Click the image below to peel back the veil and peek inside at the opening pages of Legendary Adventures: Harrowing Heights.